BioEdge: Fancy a black eye? Some bioethicists have concerns about cosmetic, or aesthetic, surgery because patients are being pressured to conform to stereotypes of beauty. But what if they are conforming to stereotypes of ugliness? Does that make an ethical difference? Take eyeball tattooing, a fad which started with a US tattoo artist who goes by the name Luna Cobra. He injects pigment directly into the eyeball so it rests under the eye's thin top layer. "If you want to amuse yourself by decorating your eyeball, why not do it?" he told the BBC. "I do a lot of things that look like tie-dye or 'cosmic space'. I think it brings a realm of fantasy into everyday life." The government of the Australian state of New South Wales has just passed a law regulating the procedure, but it may eventually ban it altogether. "I tell them you're going to look frightening forever to the majority of people you encounter. You might find people have trouble connecting with you or looking at you because they can't follow your iris." The American Optometric Association has flatly condemned the practice, claiming that it puts the patient at risk of infection, inflammation and blindness. "My advice is not to do it as there's not enough benefit to even warrant considering that risk of potential pain and loss of vision," Jeffrey Walline, of the Association, told the BBC. The object of aesthetic surgery seems to be to allow the patient to blend into a crowd of beautiful people. The object of uglification “surgery” seems to be to scare the beautiful people away. Even then there are problems with stereotyping. Last year Jason Barnum was sentenced in an Alaskan court for the attempted murder of a policeman. 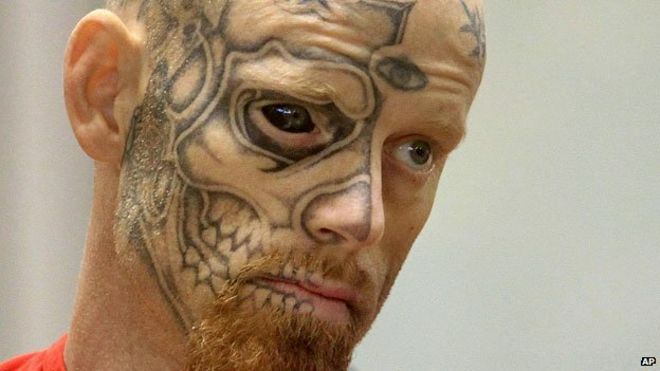 At his trial police testified that his face, and especially his black eyeball, showed that he had "decided a long time ago that his life was about being hostile to people".